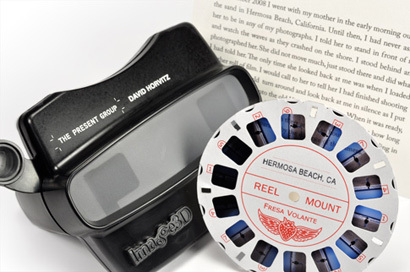 Hermosa Beach, CA is an edition of viewmaster reels and viewers accompanied by a text written by the artist, David Horvitz. The reels depict a lone figure, the artist's mother, with her back turned to the viewer as the waves of the sea crash endlessly in the background. Text of Hermosa Beach, CA: In December 2008 I went with my mother in the early morning out on the sand in Hermosa Beach, California. Until then, I had never asked her to be in any of my photographs. I told her to stand in front of me and watch the waves as they crashed on the shore. I stood behind and photographed her. She did not move much, just stood there and did what I had told her. The only time she looked back at me was when I loaded another roll of film. I would call to her to tell her I had finished shooting a roll, and she would turn around and look back at me in silence as I put the next roll of film into the old Viewmaster camera. When it was ready, she turned back around again to the sea. I do not remember how long we did this. We must have been there at least an hour or two, standing in silence on the beach separated by the distance of the camera.